As a women’s Bible study author and teacher, I have the unique privilege of talking to women from all kinds of backgrounds about their spiritual lives. I can’t tell you how many times I’ve had women share with me that they didn’t grow up in church, or they grew up in a church that “didn’t allow” them to read the Bible, and now they have to use a Bible study or devotional book in their quiet time or they’re afraid they won’t be able to understand the Bible. My heart goes out to these ladies because they desperately want to learn from God’s word, but somewhere along the way, someone or something has convinced these perfectly intelligent women–I haven’t met a dumb one, yet– that they’re not good enough or smart enough for God’s word. Ladies, you are not dumb. God created you smart enough to understand the Bible, and He created the Bible to be understandable. He loves you and wants you to read, embrace, and apply His word to your life. So don’t be afraid to throw that Daily Bread out the Open Windows of your Upper Room and read a chapter out of your Bible instead. Why? 1. Because you need spiritual nutrition, not mind candy. 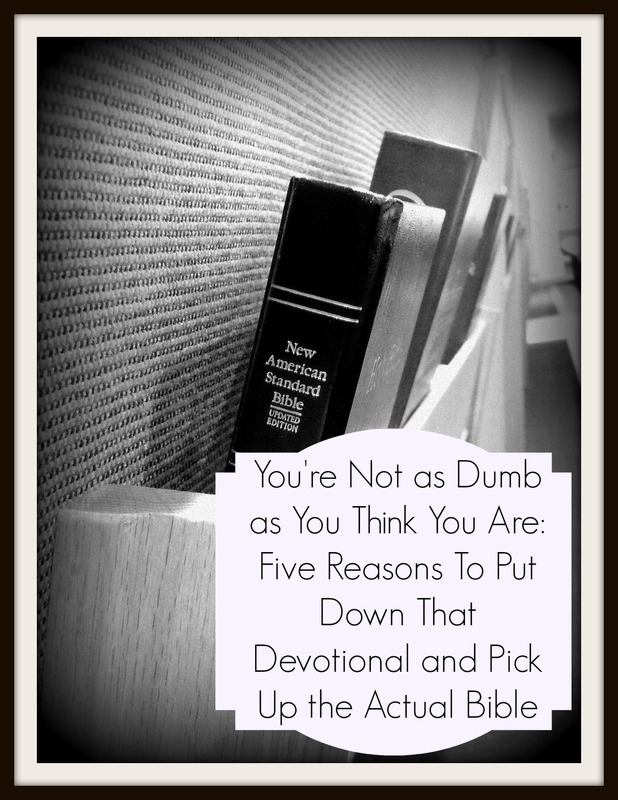 The other day I was asked my opinion of a popular women’s daily devotional web site. I read a few of the devotions, and the basic format of what I found was a Bible verse (or worse, part of a Bible verse) followed by an inspiring or poignant personal story. Frequently, the Bible verse had little or nothing to do with the story. There’s nothing wrong with reading a good story, but that’s not the same thing as studying God’s word. Other “Bible” studies are built largely on the author’s opinions. You’ll find that I think… or I believe… far outnumber God’s word says… (quoted verbatim, in context, and with a chapter/verse reference). Still others are basically advice or “life tips” books. Don’t let the fact that a book, magazine, or website bills itself as a “Bible study” or a “devotional” fool you. If all you’re reading is the author’s unsubstantiated opinions, advice, or anecdotes from her (or someone else’s) life, you are studying her story, not God’s story. There are many good, doctrinally sound studies out there that can be a fine supplement to your regular study of God’s word, and there are many more “Bible studies” and devotionals that are merely feel-good stories, or worse, contain teaching that actually conflicts with the Bible. But how will you know the difference if you don’t know what God’s word says by reading it? If you don’t know enough of what God’s word says to use it as your measuring stick for other books, you’ll end up doing the same thing a child would do when offered anything in the world that he wants to eat. He’ll choose what looks and tastes good (which might be candy or it might be poison) instead of what’s good for him. When you pick up a Bible study or devotional, you might not know what you’re getting, but when you pick up your Bible, you can be sure you’re getting the very words of God, and that’s what your spirit needs to feed on to grow up healthy. 2. Because King James has been dethroned. No disrespect intended. The King James Version of the Bible is a good translation, and the language is beautiful, but if you have trouble with 1611 English, it’s not the only game in town anymore. Some of our modern translations (please note: that’s translations not paraphrases) are actually more accurate than the KJV because thousands more biblical manuscripts have been discovered since it was first published, allowing translators to be more precise. Two of these, which I highly recommend, are the New American Standard Bible (NASB) and the English Standard Version (ESV). If you can read books, recipes, magazines, instructions, and Facebook (good heavens– if you can decipher certain Facebook posts, you can comprehend anything), and understand them, there is a Bible translation out there that you can understand. You can even check most of them out for free at BibleGateway.com. 3. Becase the Holy Spirit promised to help you. I always find it heartwarming to hear someone say, “Before I was saved, I read the Bible, but it didn’t make any sense to me. But now when I read it, I get it!” What changed? The Holy Spirit now lives inside that person. He convicts us of sin, leads us to love the things of God, and shapes us to be more like Christ. One of the ways He does that, according to 1 Corinthians 2:14-15, John 14:26, and 1 John 2:27 and other passages, is that He helps us understand and apply God’s word to our lives. Before you start reading your Bible, take a moment to pray, confess and repent of your sin, and ask the Holy Spirit to help you understand and obey His word. He’ll do it, because He keeps His promises. 4. Because you can get by with a little help from your friends. While the Holy Spirit illumines our understanding of the Scripture, it’s both immediate and a process, so sometimes, you’ll run across a verse that stumps you, a word you don’t understand, or passages that seem to conflict with each other. Fortunately, the Holy Spirit is (and was) at work helping other godly men and women to understand the Scriptures, too, and one of the ways He can help you is through their study and hard work. Take a look at your Bible. See any little superscript numbers or letters in the text? Find the corresponding letter or number, and you’re likely to see the reference for another related Bible verse. Look it up. Clear passages of Scripture interpret unclear passages, and it will probably shed some light on what you’re finding confusing. I almost hesitate to recommend study Bibles because there are so many shoddy ones out there, but if you can find a good one they are extremely helpful. Good study Bibles contain the entire text of the Bible plus notes and explanations on most of the verses. They also often contain historical, cultural, and background information on each book and author, maps, charts, glossaries, etc. As to the shoddy ones, generally speaking, stay away from “theme” Bibles (the Bible for teachers, for athletes, for petroleum engineers who eat waffles for breakfast–yes, I’m kidding– the environmental Bible, the NASCAR Bible, the Duck Dynasty Bible– no, I’m not kiding), and from any Bible whose title contains a televangelist’s name (such as the Bibles T.D. Jakes, Joyce Meyer, and Joel Osteen have put out). For my “hard copy” Bible, I use and strongly recommend the MacArthur Study Bible. It is my understanding that the Lutheran Study Bible and the ESV Study Bible are also very good, although I have not personally had a chance to check them out myself. And there are some phenomenal (and free!) study Bible apps out there. I absolutely LOVE the Faithlife Study Bible and the Bible study app from Olive Tree. Commentaries are a Bible scholar’s written explanation of Scripture. Bible dictionaries will help you with definitions of certain words and phrases. And there are many other notes, outlines, and other Bible study helps you can use to better your understanding of Scripture. The resources page at BibleGateway.com contains several of these, including Matthew Henry’s commentary (my favorite). The Christian Classics Ethereal Library (CCEL) has a treasure trove of thousands of resources to help you study. And Logos Bible Software has a great free app that has dozens of resources. 5. How badly do you really want this, anyway? Nobody ever won a medal at the Olympics by practicing her sport for five minutes a day. Edison didn’t invent the light bulb by messing around in his garage for a few hours on the weekend. And, despite the titles of some Christian books, nobody ever grew to spiritual maturity by spending five minutes a day reading a devotional. Think about the things you spend your time on. Work, cooking, cleaning, TV, social media, novels… If asked, we would probably all say that our relationship with Christ is more important than any of these things, but do our day planners reflect that? Anything worth having is worth investing time and effort into. It’s worth working at it and sharpening your skills. And nothing–nothing–is more worthwhile than growing closer to Christ. Is Christ worth some time and effort to you? So, ladies, this is probably going to sound strange coming from a women’s Bible study author, but you don’t need my book, or anybody else’s, to study the Bible. Just pick up the Scriptures, pick a book, start reading at the beginning, and keep going until you get to the end. People did that for thousands of years before Bible studies hit the scene. They did just fine, and you can too. While the Holy Spirit illumines our understanding of the Scripture, it’s both immediate and a process, so sometimes, you’ll run across a verse that stumps you, a word you don’t understand, or passages that seem to conflict with each other. Fortunately, the Holy Spirit is/was at work helping other godly men and women to understand the Scriptures, too, and one of the ways He can help you is through their study and hard work. Take a look at your Bible. See any little superscript numbers or letters in the text? Find the corresponding letter/number, and you’re likely to see the reference for another related Bible verse. Look it up. Clear passages of Scripture interpret unclear passages, and it will probably shed some light on what you’re finding confusing.